A few years back, things were rather bleak and stressful in my life. I homeschooled my daughter, served as a pastor's wife, and suffered from insomnia, all while my mother was dying of a lengthy illness. I began the habit of reading cozy mysteries at bedtime, to help me de-stress from the day. Now, I always loved a good cozy--generally a clean mystery with an amateur detective, quirky characters, and little "on-screen" violence. Perhaps they reminded me of the days growing up, reading Nancy Drew under the covers with a flashlight, thinking nobody would figure it out. Murder in Hum Harbour by Jayne E. Self is a prime example of an inspirational cozy. Start with a quirky character, or at least a character with a quirky occupation. Gailynn MacDonald is a medical receptionist. Okay, maybe that's not so quirky, but it's only part time. The job that pays the bills until she can get her sea glass jewelry business off the ground. Set that sea glass jewelry business within a picturesque seaside fishing community in Nova Scotia, Canada. Throw in more quirky small-town characters, a handsome new doctor for some romantic diversions, and, of course, a body, and you're up and running. Gailynn is collecting her sea glass--the smooth eroded remains of discarded commercial glass-- along the beach one morning when she comes across the Medical Convention, a cabin cruiser belonging to the retired doctor. With his body on the deck, of course. This is a problem for our intrepid amateur detective who has a phobia of boats. When the official police investigation increasingly targets friends and family, Gailynn pursues leads of her own to find the killer. Jayne has plotted a good mystery, with a surplus of suspects and enough twists to keep most readers guessing for a long time. I also like that she has done her homework, peppering her investigation with references to police procedure and forensics, while never departing from a cozy. While not the first book she has written, this is the first one published, and I look forward to future installments so I can spend more time in lovely Nova Scotia and see how the romance with the new doctor progresses--and solve more mysteries, of course. As for Hum Harbour, I created the fictional village from a composite of Nova Scotian communities. (We have summered in Nova Scotia for over twenty years.) The village’s name is derived from the HMS Humphrey which ran aground in 1779 while it transported a motley group of Scottish settlers to the new world. The survivors waded ashore and went no further. Like Hum Harbour, the HMS Humphrey is fiction, derived from fact. Nova Scotia, one of Canada’s ten provinces and three territories, is known as Canada’s Ocean Playground. Although the province is only 357 miles long (smaller than West Virginia), it boasts 4,600 miles of spectacular shoreline. Its rolling, sometimes mountainous countryside is mostly forested; its people are down-home friendly. Culture flourishes in Nova Scotia. Her people are fiercely loyal, and their art and music reflect the province's strong Celtic and Acadian roots. 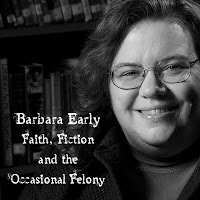 Read more of my interview with Jayne on my blog: Faith, Fiction, and the Occasional Felony. Disclaimer: I should note that Pelican Book Group is also my publisher for Gold, Frankincense and Murder (Dec 2011), and I currently work there as an editor. I have, however, received no compensation for this review, which was unsolicited and represents my personal opinion. Question: Has a novel ever made you want to travel to its setting? Where would you like to go? Barbara Early grew up buried in the snowy suburbs of Buffalo, NY, where she developed a love for all things sedentary: reading, writing, classic movies, and facebook scrabble. She holds a degree in Electrical Engineering, but her penchant for the creative caused her to run away screaming from the pocket-protector set. Barbara cooks up cozy mysteries with a healthy dose of comedy and sometimes a splash of romance. Her holiday novella, Gold, Frankincense, and Murder will be released from White Rose Publishing in time for the holiday season. You can learn more about her writing on her personal blog: http://barbearly.blogspot.com/ or see what's for dinner on her recipe blog: http://bflogal.blogspot.com/. Okay, Barb, I just downloaded it to my nook. I love a good cozy, too, so I appreciate you doing this review. Just yesterday, I was thinking I'd like to write some cozy reviews for my blog. I have quite a few authors that I like. I just have to comment on one thing... Medical receptionist = quirky job? Hmmm... I spent many years as a medical receptionist. Quirky? My husband would say I resembled that comment. Lol. Hope you like it, Suzie. This is one of Harbourlight's first releases. I loved the story! With Gai's quirky personality and jumping to all kinds of misleading conclusions she had me muddled all the way. Loved it! Thanks for stopping by. I agree about Gai. That's a fun aspect to the story. Glad you enjoyed it too! I look forward to this read. Love the concept. As an aside, I also read Nancy Drew and with a flashlight under the covers. Thanks for commenting. I think we've noticed that a lot of writers grew up on Nancy, and still have a soft spot in their hearts for her and for the cozy. Thanks, Clare, for stopping by. Hope you enjoy it. Just read a novel set in the Colorado mountains that made me want to travel there. Walks Alone by Sandi Rog. It will release in early 2012. Oooh. I haven't been to Colorado since I was in grade school. I considered going to the ACFW conference when it was in Denver, but feared that the altitude might wreak havoc with my asthma. But I could go there in a book, I guess. Love cozy mysteries, love seaside communities, and am really looking forward to reading this one! As for a place reading has made me want to go... Norway, after reading the works of Sigrid Undset. Reading regional novels always sends me to the kitchen to try regional, too. No apologies needed, Lilly. And glad to have you stop by. And yes, I think you'd enjoy Jayne's book. Sorry to be a day late but oh, I'm so glad I checked in. I recall you telling us how much you enjoyed this book. I had no idea it was set in Nova Scotia. I'm so excited about that! I've traveled there and envy the fact Jayne has traveled there so often. What a great plot and setting. I think you've sold me, Barb! I've often talked about my love of Elizabeth Peters' Amelia Peabody mysteries which have certainly made me want to go to Egypt. Great trailer, by the way! It has a tv movie commercial feel to it. Perfect for a cozy! Seven Wonders of the World; and More! Tiffany Colter: What I’ve learned from Failure? Welcome Lisa Jordan, Love Inspired Author! Are your wells stopped up?